My LED strips keep “burning out”! You may come across the problem with flexible LED strips that seem to have a few LEDs in a row that flicker or just don’t light up anymore. To fix the problem, you’ll need to first figure out the the root cause. If they have burnt out completely, and nothing on the strip is lighting up anymore, this could simply be a loose connection. So be sure to double and triple check your connections. However, if a few of the LEDs on a strip are flickering, it could be a loose connection on the strip itself or the power supply voltage could be too low. In that case, check that the voltage of the lights and driver match. If the voltage is OK, and some LEDs are still flickering, you can try to find the a loose connection on the strip, and then re-solder it. Or if that’s too difficult, you may have to just replace the strip with a new one. I have the flexible led lights strips. I have wired them into my cig lighter. For some reason they seem to keep (burning out) going out (not sure whats it’s called). Does anyone have any idea why this is. Do I need to add in resistors somewhere. i thought the strips were already set that way. I can show you pics or provide more info if it would help. I see we already sent you replacements, we don’t have many problems with the 4.7″ Flex LED Strips. Well the replacements showed up the next (which is awesome, A+++ customer service), but last night I noticed a flickering and when I looked at the light 3 of the leds we’re flickering (looked like they were on their last leg). that’s why i was posting here, to see if I maybe had something set up wrong etc. is it normal when these go out for them to go out in set’s of three. It’s never just one bulb that goes out, but always three at a time that are affected. I can provide pics or more details, but any help is appreciated. On a side note, I found a use for the old strips, but an additional 3 bulbs burned out in those as well. Out of a total of 24 bulbs (2 4.7 strips) there are only 9 lights remaining. Yes, they’ll go out in threes. They’re wired that way. How are you mounting them? Is it possible you’re doing something like pinching the strips too hard with zip ties or something? Haven’t permanently mounted them yet (after the issue with the first set). I’ve been using velcro adhesive strips, so I don’t think pinching is the problem. Do you have any idea what voltage you are feeding them? this is hooked up through the wiring for the car’s cig lighter which from my understanding should be a 12V power supply. The fuse for this circuit is a 20amp. i didn’t wire one in my self, it’s just the normal fuse in the car’s fuse box. It sounds like just a couple bad strips in a row. It happens. You need to test your car’s voltage. Cars almost never run off of just 12v. The alternator usually puts out around 14v, and the battery is at 12v. Test your voltage. If the problem continues you can add a small resistor. You can try either a 15ohm 1/2watt or 30ohm 1/2watt resistor on them to see if that helps combat the problem. Here’s the thing with that (and I’m not say you’re incorrect in any way b/c you aren’t), these strips are designed for automotive lighting. It’s well known that the actual voltage isn’t 12V, it’s ~14V. The strips should be designed for 14V. One shouldn’t need to add a resistor to a product that’s used as designed. But, that’s just my 2 cents. A resistor is NOT NECESSARY whatsoever. Thanks for all of the advice. I thought I had everything basically right, but as I’m not an expert I thought maybe I had missed something or overlooked something. It’s just great that this board exists and everyone is willing to be so helpful. I’ll keep an eye on them and if it seems like the strip (only one of the new ones seems to be having this problem) goes out I’ll let you know. Right now it’s just flickering from time to time, but that’s what happened with the other 2 before they went out. You can also try a 12v regulator and see if that helps. Its possible that you are getting voltage spikes that are buring them up. I completly agree with you. One shouldn’t have to do that. The typical cause for LEDs failure is called thermal runaway. Its when an LED get too hot and starts to eat more and more current until its ultimate failure. The resistors are calculated for a certain voltage, and it could be set too high which would be fine, but it could be set too low and thats where the problem will be. LEDs can handle higher than normal voltages but only for a certain length of time. The LED under too much voltage will start to heat up, and then the current will start to rise as the LED goes into thermal runaway. If you current regulate an LED then the voltage will be controlled by the LED itself. ICELED does this in all of their products. They control the current instead of the voltage. It eliminates that problem. But there is a lot more quality control put into ICELED that makes it more reliable. they will use whatever amperage they use. you can control it tomake sure they don’t go out of bounds, or you could just install them and let them run on their own. you could build a current regulator, but thats up to you. if i was having that much trouble with other strips i would do that. It changed because you tested them on a battery charger and not a power supply. A charger will adjust the current depending on the load it “sees.” Switching it to 10A just gave it a higher charge rate for a given load. This just allowed it to feed more current to the LED load. When an LED starts to heat up, does it appear to be dimmer? Just asking as it seemed like the leds got dimmer before they began flickering and ultimately burning out. BTW – just as an update for those interested. One of the 2 new strips is still goin fine. the other has three lights that are flickering (I’m guessing they burn out soon). As to the original two strips I had, both have 3 out of 12 led in working condition, although one of them from time to time will suddenly light up 9 of the leds (this only lasts for about a 1-2 seconds, then it flickers and dies). I’m guessing that the flickering LEDs are a loose connection in the strip. I’ve seen the loose connection issue appear on here a few times before. 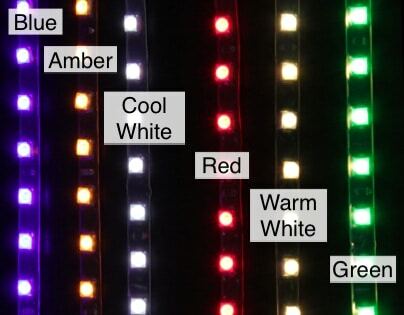 LEDs don’t flicker before they die, they just don’t light up anymore. if it is a loose connection try aply some pressure to the sides of the strips to see if that will get them to light up again.